← Domínguez, Jorge I., Rafael Fernández de Castro (eds.). Contemporary U.S.-Latin American Relations: Cooperation or Conflict in the 21st Century? 2010. Trutino, John (ed.). Mexico and Mexicans in the Making of the United States. 2013. Mexico and Mexicans have been involved in every aspect of making the United States from colonial times until the present. Yet this shared history is a largely untold story, eclipsed by headlines about illegal immigration and the drug war. Placing Mexicans and Mexico in the centre of American history, this volume elucidates how economic, social, and cultural legacies grounded in colonial New Spain shaped both Mexico and the United States, as well as how Mexican Americans have constructively participated in North American ways of production, politics, social relations, and cultural understandings. 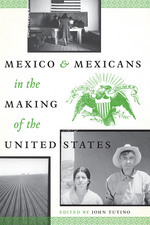 Combining historical, sociological, and cultural perspectives, the contributors to this volume explore the following topics: the Hispanic foundations of North American capitalism; indigenous peoples’ actions and adaptations to living between Mexico and the United States; U.S. literary constructions of a Mexican “other” during the U.S.- Mexican War and the Civil War; the Mexican cotton trade, which helped sustain the Confederacy during the Civil War; the transformation of the Arizona borderlands from a multiethnic Mexican frontier into an industrializing place of “whites” and “Mexicans”; the early-twentieth-century roles of indigenous Mexicans in organizing to demand rights for all workers; the rise of Mexican Americans to claim middle-class lives during and after World War II; and the persistence of a Mexican tradition of racial/ethnic mixing–mestizaje–as an alternative to the racial polarities so long at the centre of American life.